Cameron Winklevoss and Tyler Winklevoss, universally known and referred to as the Winklevoss Twins, have taken an unusual road towards achieving their fame. 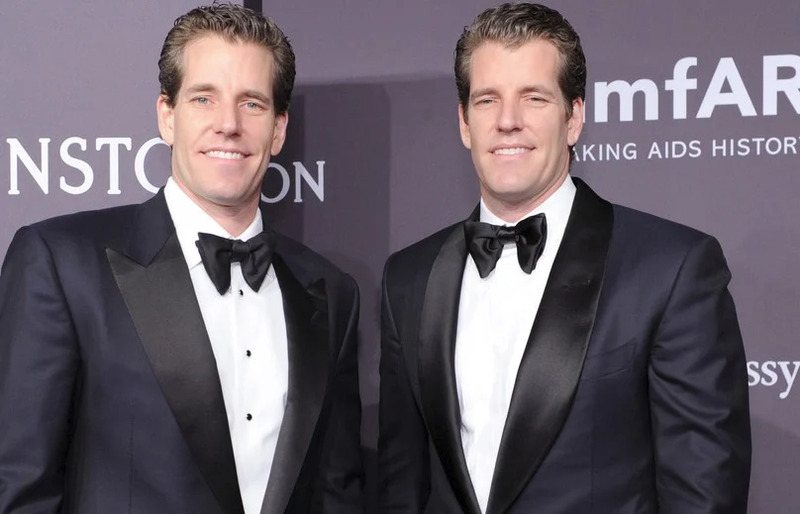 Few can include on their resumes that they are Olympians, Harvard Graduates, and Bitcoin billionaires, but those are exactly the types of achievement the Winklevoss Twins are known for. Born in Southampton New York and raised in Greenwich Connecticut. As young students at the all boys preparatory Brunswick School, the two boys thrived in the classics, showing a penchant for Latin and Ancient Greek. Under the tutelage of neighbor and friend Ethan Ayer and coach James Mangan, the two boys approached the headmaster of their high school, and asked if they could create a rowing team1. To this day, the same rowing team exists at the Brunswick School. By this point, the two Twins understood that they were something special.Their sophomore year of high school, the twins took several ergometer tests, and found that they placed in the top twenty junior rowers in the nation. The following season, the twins competed on the junior national rowing team. After their high school careers came to an end, they continued their education at Harvard, where they led stellar careers; they won the national championship in 2003 and 2004, and only suffered one loss throughout their collegiate careers. 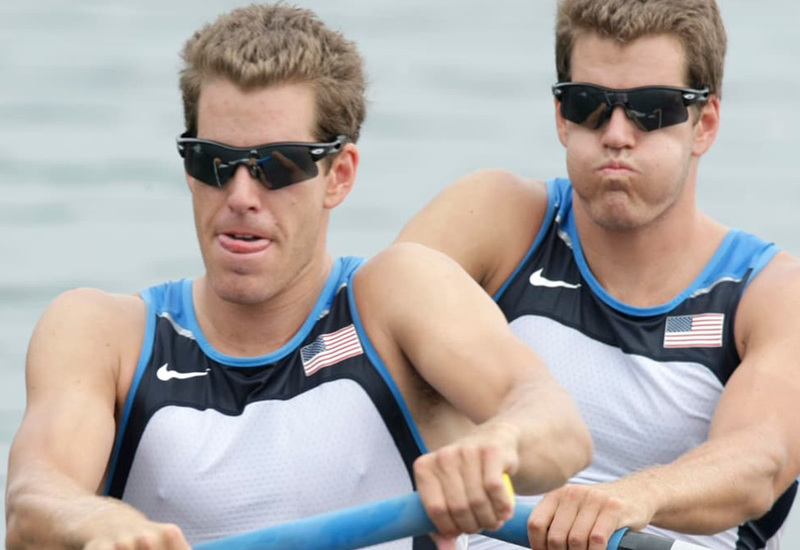 The twins rowing for USA, Image from Dailybeast. Cameron and Tyler Winklevoss continued their training post graduation and competed at the international level. Their first international success came at the 2007 Pan American games, when alongside teammates Sebastian Bea and Gabe Winkler, the Winklevoss Twins placed second and won the silver medal2 Later, making a commitment to the 2008 Beijing Olympics, the two graduates continued training at Clemson University in South Carolina. After experimenting with two-man, four-man, and eight-man boats, the coaches decided that a two-man boat would best make use of their skills. Competing in the men’s coxless pair event, the brothers failed to finish within the top three in their first heat, and did not qualify for the following round.. In the Repechage – the last chance to make the Semifinals – they placed in first, advancing them to the Semifinals. A good finish in the second Semifinal placed them in the final, where they placed sixth out of fourteen countries which had qualified for the olympics3. As much fame as they acquired as Olympians, Cameron and Tyler Winklevoss are far more famous for their early involvement with Mark Zuckerberg at Harvard University. In their Junior year at Harvard, the two twins, along with Divya Narendra, sketched out the concept for Harvard Connection, later to be renamed ConnectU4. 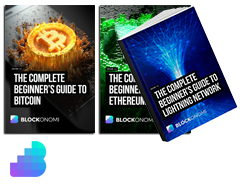 Work began on the project in December 2002, when Narendra laid out the plans before the Winklevoss twins. Recognizing the potential in the idea, they helped Narendra bring the concept to life. Because none of them had the necessary coding expertise to help launch the project, an additional team of programmers was brought in in order to speed up the design. By November 2003, these three coders – Sanjay Mavinkurve, Joe Jackson, and Victor Gao- had made significant progress on developing the code. Front-end pages, the registration system, a database, and back-end coding, were all ready to be implemented at this time. The group intended to expand to other universities, but could not do so until Victor Gao was replaced. In came Mark Zuckerberg. He had achieved serious notoriety throughout campus as the creator of “Facemash” that flashed two pictures of Harvard students next to one another and and allowed users to vote on who they considered to be more attractive. Although its questionable integrity left a bad taste in the administration, it seriously impressed the Winklevoss Twins and the crew that they had assembled. Zuckerberg was handed the reins from Gao and became responsible for coding the project. While things seemed initially promising, with Zuckerberg emailing the group to state that “I have most of the coding done, and I think that once I get the graphics we’ll be able to launch this thing.”5 Soon however, the professional relationship between Zuckerberg and the Winklevoss Twins soured. He refused to show his work, and frequently made excuses as to why he was unable to be reached. A follow-up meeting confirmed Zuckerberg’s interest in continuing work with the group. A month later, Zuckerberg informed the group that he was involved in another project. By February 2004, Facebook was live, and the Winklevoss Twins were quick to sue. The debacle with Mark Zuckerberg would have set others back, but the Winklevoss Twins made the most out of the situation. After winning $65 million from the Facebook lawsuit, the twins decided to invest $11 million of that into Bitcoin. While many saw the the investment as unnecessarily risky and many laughed at their so called gamble, Cameron and Tyler knew exactly what they were doing6. Purchasing approximately 120,000 Bitcoins when they were less than $10 each, their investment has now risen exponentially, and together, the twins are worth more than $1 Billion. Today, the twins take extensive efforts to ensure the safety of their fortune. While most would agree that using a cold wallet with a private key would suffice, the Winklevoss case is truly exceptional. As reported by Business Insider, they take it one step further; they cut up a paper printout of the private key, and store it in different banks spread throughout the country8. The precautions the Winklevoss Twins take are far for typical. But then again, their fortune is also far from typical. The Winklevoss Twins have also been involved with the online exchange, Gemini. Following their personal philosophy of properly securing funds, Gemini created a high-tech version of their key distribution plan. 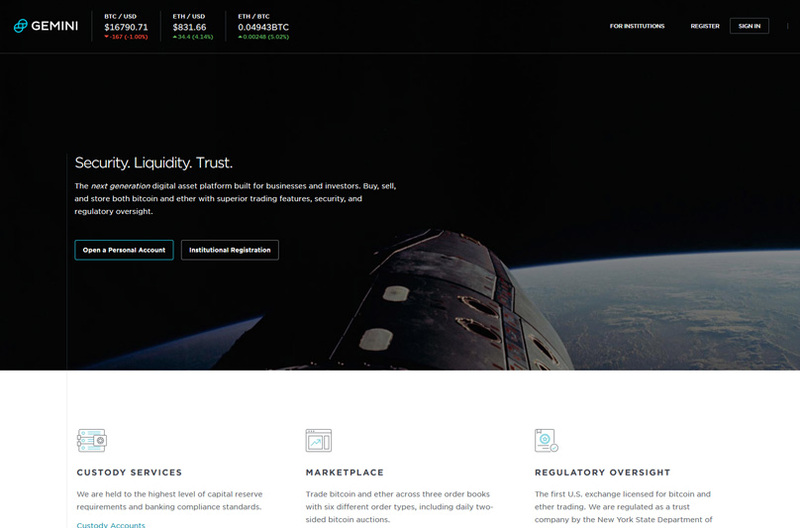 Additionally, Gemini received a license from New York State regulators, allowing them to hold Bitcoins for regulated banks and asset managers. This has turned Gemini into a trusted exchange for investors, and an “underappreciated exchange” according to Ari Paul, a managing partner at the virtual currency hedge fund BlockTower capital. Gemini is not without its kinks, but that has not stopped the Winklevoss Twins from expanding its old 5,000-square-foot offices to 35,000-square-foot facilities in Midtown Manhattan. Take a look at our full Gemini Exchange review to find out more about this side of their business. 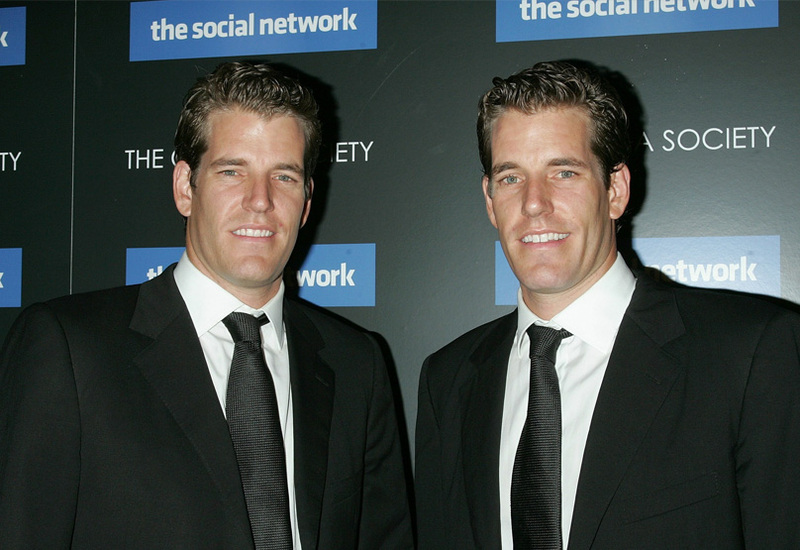 To this day, the Winklevoss Twins continue to have a series of detractors, who claim that their investments are poor decisions. Despite their track record of success, there remain serious doubters as to the saviness of the Winklevoss investments. Criticism has never stopped them however, with Tyler Winklevoss claiming in an interview that “… [they have] turned that laughter and ridicule into oxygen and wind at [they’re] back.” Following a mantra of “live by the sword and die by the sword,” the two twins are are going to continue making high-risk and unusual investments, all the while laughing at those who question their financial prowess.